The interim prime minister of beleaguered Ukraine was to make the rounds here on Wednesday as he seeks help bolstering his fragile government and even more fragile economy while somehow reversing Russia’s occupation of the Crimean Peninsula, reports nytimes.com. Arseniy P. Yatsenyuk, an opposition leader named interim prime minister after the fall of the pro-Russia government in Kiev last month, was to meet with President Obama at the White House as well as Secretary of State John Kerry at the State Department and congressional leaders on Capitol Hill. He then was to head to New York, where he is scheduled to address the United Nations on Thursday. Mr. Yatsenyuk’s visit comes at a critical moment for his country. Crimea, where Russian troops have been solidifying their positions, is scheduled to hold a referendum Sunday on whether to remain in Ukraine or rejoin Russia. Mr. Yatsenyuk and the governments of the United States, Germany, Britain and other European powers have called that vote illegitimate and illegal, but they have been unable to stop it from proceeding. Just as significant on Mr. Yatsenyuk’s agenda for Washington will be seeking a booster shot for Ukraine’s flailing economy. Mr. Kerry has committed $1 billion in loan guarantees, and Congress is working on legislation to make that happen, but that is just a small fraction of what Ukraine is reported to need to prevent a more dire financial and economic slide. For Mr. Obama, the visit is a chance to show that he is standing by the new pro-Western Ukrainian government that came to power after street protests in Kiev toppled the Russia-aligned government of President Viktor F. Yanukovych. Mr. Obama will be joined at the 2:45 p.m. meeting in the Oval Office by Mr. Kerry and Vice President Joseph R. Biden Jr., who is rushing back from a trip to Chile. In a speech at the State Department on Tuesday, Susan E. Rice, the president’s national security adviser, restated the administration’s support for Ukraine in its confrontation with President Vladimir V. Putin of Russia. "We are working in close coordination with our European partners, offering assistance to the new government in Kiev and making it clear to President Putin that his flagrant violation of international law comes at a real cost,” she said. The visit comes a day after the House passed a nonbinding resolution expressing support for Ukraine and for sanctions against Russia; the House has already passed legislation authorizing the loan guarantees. "Vladimir Putin has proved himself a menace and a threat to stability in the region and he must be held accountable,” Speaker John A. Boehner, Republican of Ohio, said in a statement. Mr. Yatsenyuk was to be hosted on Wednesday evening at the Capitol by Senator Robert Menendez, Democrat of New Jersey, and the rest of the Senate Foreign Relations Committee, which is working on its own legislation providing aid to Kiev and punishment for Russia. Legislation championed by Mr. Menendez would provide the loan guarantees for Ukraine as well as $50 million to help encourage democracy in Ukraine and an additional $100 million for enhanced security cooperation with Ukraine and other East European states. It would also authorize sanctions in addition to those contemplated by Mr. Obama. Mr. Yatsenyuk has become the face of the new Ukrainian government after leading months of street protests against Mr. Yanukovych. 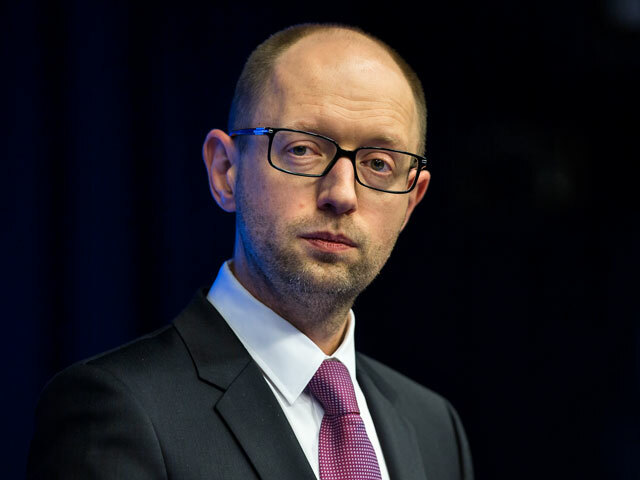 Thin, balding and bespectacled, Mr. Yatsenyuk, 39, brings a long résumé to the post, having served as economics minister, foreign minister and speaker of Parliament. With his roots in the opposition party of former Prime Minister Yulia Tymoshenko, he ran for president in 2010 but won just 7 percent of the vote in the first round. Nonetheless, he has been seen as a favorite of Washington, especially compared with some of his allies in the opposition movement. "I think Yats is the guy who’s got the economic experience, the governing experience,” Victoria J. Nuland, the assistant secretary of state for the region, told a colleague in a January telephone call that was mysteriously tapped and later posted on the Internet. In a speech to Parliament before leaving Kiev for Washington, Mr. Yatsenyuk noted that the United States along with Russia and Britain had signed a treaty in 1994 with Ukraine pledging to uphold its security in exchange for giving up the nuclear weapons it still held at the breakup of the Soviet Union.